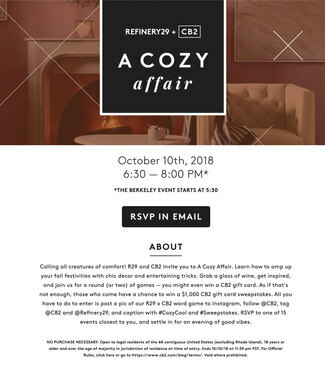 On October 10th, Refinery29 and CB2 will be hosting an event in 14 cities across the country. Learn how to amp up your fall festivities with chic decor and entertaining tricks. Grab a glass of wine, get inspired, and join us for a round (or two) of games — you might even win a CB2 gift card. As if that’s not enough, those who come have a chance to win a $1,000 CB2 gift card sweepstakes. All you have to do to enter is post a pic of our R29 x CB2 word game to Instagram, follow @CB2, tag @CB2 and @Refinery29, and caption with #CozyCool and #Sweepstakes. RSVP to one of 15 events closest to you, and settle in for an evening of good vibes.